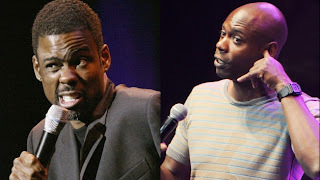 XOXO Jes - Canadian Entertainment News: Dave Chappelle and Chris Rock...the TOUR?! Dave Chappelle and Chris Rock...the TOUR?! Could Dave Chappelle and Chris Rock actually be planning a comedy tour together? Well according to Chris Rock they are working on a show together in New York and if it goes well they may plan a tour. If dreams did come true the Chappelle Show would come back and we would see some more Tyrone Biggums and Clayton Bigsby. But I would settle for a joint comedy tour in the meantime.